The history of the Jews in Ireland extends back nearly a thousand years. Although the Jewish community has always been small in numbers (not exceeding 5,500 by religion since at least 1891), it is well established and has generally been well-accepted into Irish life. Jews in Ireland have historically enjoyed a relative tolerance that was largely absent elsewhere in Europe. The earliest reference to the Jews in Ireland was in the year 1079. The Annals of Inisfallen record "Five Jews came from over sea with gifts to Toirdelbach [king of Munster], and they were sent back again over sea". They were probably merchants from Normandy. Toirdelbach was the grandson of Brian Boru, a previous High King of Ireland. No further reference is found until nearly a century later in the reign of Henry II of England. That monarch, fearful lest an independent kingdom should be established in Ireland, prohibited a proposed expedition there. Strongbow, however, went in defiance of the king's orders and, as a result, his estates were confiscated. In his venture Strongbow seems to have been assisted financially by a Jewish moneylender, for under the date of 1170 the following record occurs: "Josce Jew of Gloucester owes 100 shillings for an amerciament for the moneys which he lent to those who against the king's prohibition went over to Ireland". By 1232, there was probably a Jewish community in Ireland, as a grant of 28 July 1232 by King Henry III to Peter de Rivel gives him the office of Treasurer and Chancellor of the Irish Exchequer, the king's ports and coast, and also "the custody of the King's Judaism in Ireland". This grant contains the additional instruction that "all Jews in Ireland shall be intentive and respondent to Peter as their keeper in all things touching the king". The Jews of this period probably resided in or near Dublin. In the Dublin White Book of 1241, there is a grant of land containing various prohibitions against its sale or disposition by the grantee. Part of the prohibition reads "vel in Judaismo ponere" (prohibiting it from being sold to Jews). The last mention of Jews in the "Calendar of Documents Relating to Ireland" appears about 1286. When the expulsion from England took place (1290), Jews living in the English Pale may have had to leave English jurisdiction, but there is no evidence for this; and it would certainly have not been difficult for Jews to remain in Ireland in defiance of the 1290 Edict, simply by moving beyond the area of English settlement into the Irish Gaelic areas that England did not control. As the next paragraph illustrates, Jews were certainly living in Ireland long before Oliver Cromwell revoked the English Edict of Expulsion nearly 400 years later, in the mid-seventeenth century. A permanent settlement of Jews was definitely established in the late fifteenth century. Following their expulsion from Portugal in 1497, some of these Sephardic Jews settled on Ireland's south coast. One of them, William Annyas, was elected mayor of Youghal, County Cork, in 1555. Francis Annyas (Ãnes), was a three-time Mayor of Youghal in 1569, 1576 and 1581. Ireland's first synagogue was founded in 1660 near Dublin Castle. A plot of land was acquired in 1718 as a burial ground, called Ballybough Cemetery, it was the first Jewish cemetery. It is situated in the Fairview district of Dublin, where there was a small Jewish colony. In December 1714, the Irish philosopher John Toland issued a pamphlet entitled Reasons for Naturalizing the Jews in Great Britain and Ireland. In 1746 a bill was introduced in the Irish House of Commons "for naturalising persons professing the Jewish religion in Ireland". This was the first reference to Jews in the House of Commons up to this time. Another was introduced in the following year, agreed to without amendment and presented to the Lord Lieutenant to be transmitted to England but it never received the royal assent. These Irish bills, however, had one very important result; namely, the formation of the Committee of Diligence, which was organized by British Jews at this time to watch the progress of the measure. This ultimately led to the organisation of the Board of Deputies, an important body which has continued in existence to the present time. Jews were expressly excepted from the benefit of the Irish Naturalisation Act of 1783. The exceptions in the Naturalisation Act of 1783 were abolished in 1846. The Irish Marriage Act of 1844 expressly made provision for marriages according to Jewish rites. Daniel O'Connell is best known for the campaign for Catholic Emancipation; but he also supported similar efforts for Jews. In 1846, at his insistence, the British law "De Judaismo", which prescribed a special dress for Jews, was repealed. O’Connell said: "Ireland has claims on your ancient race, it is the only country that I know of unsullied by any one act of persecution of the Jews". ...contributed during the Irish famine of 1847 ... a sum far beyond the joint contributions of the Devonshires, and Herefords, Lansdownes, Fitzwilliams and Herberts, who annually drew so many times that amount from their Irish estates. Since Ireland's Jews were city folk, businessmen, professionals and merchants, they bought their food instead of growing it and were thus not badly affected by the famine themselves. In 1874, Lewis Wormser Harris was elected to Dublin Corporation as Alderman for South Dock Ward. Two years later he was elected as Lord Mayor of Dublin, but died 1 August 1876 before he took office. 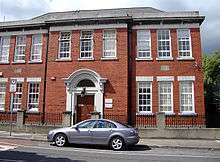 The former Jewish school in Bloomfield Avenue, Portobello, Dublin. There was an increase in Jewish immigration to Ireland during the late nineteenth and early twentieth centuries. In 1871, the Jewish population of Ireland was 258; by 1881, it had risen to 453. Most of the immigration up to this time had come from England or Germany. A group who settled in Waterford were Welsh, whose families originally came from Central Europe. In the wake of the Russian pogroms there was increased immigration, mostly from Eastern Europe (in particular Lithuania). By 1901, there were an estimated 3,771 Jews in Ireland, over half of them (2,200) residing in Dublin. By 1904, the total Jewish population had reached an estimated 4,800. New synagogues and schools were established to cater for the immigrants, many of whom established shops and other businesses. Many of the following generation became prominent in business, academic, political and sporting circles. Jewish wedding at the Waterford Courthouse, early September 1901. The Jewish population of Ireland reached around 5,500 in the 1940s, but has since declined to about 1000 - 1100, mainly due to assimilation and emigration. The Irish Jewish population saw a large drop in numbers in 1948 after the establishment of Israel; a large percentage of Irish Jews moved there out of ideological and religious convictions. In the subsequent decades, many other Jews would also emigrate to Israel, the United Kingdom, and United States due to the decline of Jewish life in Ireland and for better economic prospects. In addition, rates of intermarriage and assimilation, including conversion to Catholicism in order to marry, were also high. The Republic of Ireland currently has four synagogues: three in Dublin, one in Cork. There is a further synagogue in Belfast in Northern Ireland. The economic boycott waged against the small Jewish community in Limerick City in the first decade of the twentieth century is known as the Limerick Boycott (and sometimes known as the Limerick Pogrom), and caused many Jews to leave the city. It was instigated by an influential Redemptorist priest, Father John Creagh who called for a boycott during a sermon in January 1904. A teenager, John Raleigh, was arrested by the police and briefly imprisoned for attacking the Jews' rebbe, but returned home to a welcoming throng. According to an RIC report 5 Jewish families left Limerick "owing directly to the agitation" and 26 families remained. Some went to Cork, where trans-Atlantic passenger ships docked at Cobh (then known as Queenstown). They intended to travel to America. Gerald Goldberg, a son of this migration, became Lord Mayor of Cork in 1977. The boycott was condemned by many in Ireland, among them the influential Standish O'Grady in his paper All Ireland Review, depicting Jews and Irish as "brothers in a common struggle", though using language differentiating between the two. The Land Leaguer Michael Davitt (author of The True Story of Anti-Semitic Persecutions in Russia), in the Freeman's Journal, attacked those who had participated in the riots and visited homes of Jewish victims in Limerick. His friend, Corkman William O'Brien MP, leader of the United Irish League and editor of the Irish People, had a Jewish wife, Sophie Raffalovic. Father Creagh was moved by his superiors initially to Belfast and then to an island in the Pacific Ocean. In 1914 he was promoted by the Pope to be Vicar Apostolic of Kimberley, Western Australia, a position he held until 1922. He died in Wellington, New Zealand in 1947. Joe Briscoe, son of Robert Briscoe, the Dublin Jewish politician, describes the Limerick episode as “an aberration in an otherwise almost perfect history of Ireland and its treatment of the Jews”. Since 1983, several commentators have questioned the traditional narrative of the event, and especially whether the event's description as a pogrom is appropriate. Historian Dermot Keogh sympathised with the use of the term by the Jews who experienced the event, and respected its use by subsequent writers, but preferred the term "boycott". It should be noted that Creagh’s anti-Semitic campaign, while virulent, did not result in the decimation of Limerick’s Jewish community. The 1911 census records that, not only were 13 of the remaining 26 families still resident in Limerick six years later but that 9 new Jewish families had joined them. The Jewish population numbered 122 persons in 1911 as opposed to 171 in 1901. This had declined to just 30 by 1926. Many Irish Jews supported the Irish Republican Army (IRA) and the First Dail during the Irish War of Independence. Michael Noyk was a Lithuanian-born solicitor who became famous for defending captured Irish Republican prisoners such as Sean MacEoin. Robert Briscoe was a prominent member of the IRA during the Irish War of Independence and the Irish Civil War. He was sent by Michael Collins to Germany in 1920 to be the chief agent for procuring arms for the IRA. Briscoe proved to be highly successful at this mission, and arms arrived in Ireland in spite of the British blockade. In an effort to provide minority communities with political representation in parliament (as was the case with minority Christian denominations) Ellen Cuffe (Countess of Desart), a member of the Jewish community, was appointed for a twelve-year term by William T. Cosgrave to the Irish Senate in 1922. She sat as an independent member until her death in 1933. She was also an advocate for the Irish language and served as President of the Gaelic League. The Irish Constitution of 1937 specifically gave constitutional protection to Jews. This was considered to be a necessary component to the constitution by Éamon de Valera because of the treatment of Jews elsewhere in Europe at the time. The reference to the Jewish Congregations in the Irish Constitution was removed in 1973 with the Fifth Amendment. The same amendment removed the 'special position' of the Catholic Church, as well as references to the Church of Ireland, the Presbyterian Church, the Methodist Church, and the Religious Society of Friends. A committee organised the Kindertransport. About ten thousand unaccompanied children aged between three and seventeen from Germany and Czechoslovakia were permitted entry into the United Kingdom without visas in 1939. Some of these children were sent to Northern Ireland. Many of them were looked after by foster parents but others went to the Millisle Refugee Farm (Magill's Farm, on the Woburn Road) which took refugees from May 1938 until its closure in 1948. The Irish envoy to Berlin, Charles Bewley, appointed in 1933, became an admirer of Hitler and National Socialism. His reports contained incorrect information on the treatment of Jews in Germany, and he was against allowing Jews move to Ireland. After being reprimanded by Dublin, he was dismissed in 1939. The Irish state was officially neutral during World War II, known within the Republic of Ireland as "The Emergency" although it is estimated that about 100,000 men from the state took part on the side of the Allies, while a handful may have taken the part of their opponents. In Rome, T.J. Kiernan, the Irish Minister to the Vatican, and his wife, Delia Murphy (a noted traditional ballad singer), worked with the Irish priest Hugh O'Flaherty to save many Jews and escaped prisoners of war. Jews conducted religious services in the church of San Clemente of the ‘Collegium Hiberniae Dominicanae’, which had Irish diplomatic protection. There was some domestic anti-Jewish sentiment during World War II, most notably expressed in a notorious speech to the Dáil in 1943, when newly elected independent TD Oliver J. Flanagan advocated "routing the Jews out of the country". On the other hand, Henning Thomsen, the German chargé d'affaires, officially complained of press commentaries. In February 1939, he protested against the Bishop of Galway who had issued a pastoral letter, along similar lines, accusing Germany of "violence, lying, murder and the condemning of other races and peoples". 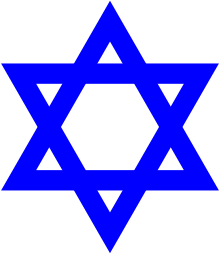 Although overt anti-Semitism was not typical, the southern Irish were indifferent to the Nazi persecution of the Jews and those fleeing the third Reich....A successful applicant in 1938 was typically wealthy, middle-aged or elderly, single from Austria, Roman Catholic and desiring to retire in peace to Ireland and not engage in employment. Only a few Viennese bankers and industrialists met the strict criterion of being Catholic, although possibly of Jewish descent, capable of supporting themselves comfortably without involvement in the economic life of the country. Two Irish Jews, Esther Steinberg and her infant son, are known to have been killed during the Holocaust, which otherwise did not substantially directly affect the Jews actually living in Ireland. The Wannsee Conference listed the 4,000 Jews of Ireland to be among those marked for killing in the Holocaust. It has always been the policy of the Minister for Justice to restrict the admission of Jewish aliens, for the reason that any substantial increase in our Jewish population might give rise to an anti-Semitic problem. However, De Valera overruled the Department of Justice and the one hundred and fifty refugee Jewish children were brought to Ireland in 1948. Earlier, in 1946, one hundred Jewish children from Poland were brought to Clonyn Castle in County Meath by Solomon Schonfeld. In 2000 many of the Cloyne Castle children returned for a reunion. In 1952 he again had to overrule the Department of Justice to admit five Orthodox families who were fleeing the Communists. In 1966, the Dublin Jewish community arranged the planting and dedication of the Éamon de Valera Forest in Israel, near Nazareth, in recognition of his consistent support for Ireland's Jews. In 2006 Tesco, a British supermarket chain, had to apologise for selling the notorious antisemitic forgery The Protocols of the Elders of Zion in its stores in Britain and Ireland. Sheikh Dr Shaheed Satardien, head of the Muslim Council of Ireland, said this was effectively "polluting the minds of impressionable young Islamic people with hate and anger towards the Jewish community". Dr. Bethel Solomons played rugby union for Wesley College and for Ireland earning 10 caps from 1907-1910. The Lithuanian born Louis Bookman (1890–1943) who moved to Ireland as a child, played soccer at international level for Ireland (winning the Home International Championship in 1914), as well as playing at club level for Shelbourne and Belfast Celtic, he also played cricket for Railway Union Cricket Club, the Leinster Cricket Club and for the Irish National Cricket Team. Louis Collins Jacobson played cricket for Ireland opening the innings on 12 occasions, and also at club level in Dublin as the opening bat for Clontarf C.C. and earlier, for Carlisle Cricket Club in Kimmage which was made up of members of the Dublin Jewish community. Dublin Maccabi was a Soccer team in the Kimmage/Terenure/Rathgar areas, they played in the Dublin Amateur Leagues, only players who were Jewish played for them, Maccabi played their games in the KCR grounds which opened in the 1950s, they disbanded in 1995 due to dwindling numbers and disputes over fees, and many of their players joined the Parkvale F.C. For a time Dublin Jewish Chess Club played in the Leinster leagues in 1936 winning the Ennis Shield being promoted to play in Division 1 Armstrong Cup, an earlier Jewish team had played in the 1908 Armstrong Cup. Riga born Philip Baker(1880-1932) was Irish Chess Champion in 1924, 1927, 1928, and 1929. There was also a Dublin Jewish Boxing Club, on the south side of the city. It was based for its whole existence of many years, in the basement of the Adelaide Road Synagogue, which was the largest synagogue in the country. Many fine boxers were produced, amongst whom were Sydney Curland, Freddie Rosenfield, Jerry Kostick, Frank and Henry Isaacson, and Zerrick Woolfson. As a boxer, Jerry Kostick represented Ireland at the 1949 Maccabiah Games and the 1953 Maccabiah Games and, representing Trinity College Dublin, won two Universities Athletic Union titles. Kostick also played rugby and football for Carlisle for over ten years, while Woolfson also played cricket for Carlisle C.C. for several years, and, in 1949 for Dublin University, when he bowled a hat-trick in his first match. As reported in the newspapers, he dismissed J.V.Luce, Mick Dargan and Gerry Quinn with 3 successive balls. They were all very competent, current international players. He also played first division table-tennis for Anglesea T.T.C. as the #3 player, joining Willie Heron and Ernie Sterne, both international players, on the 1st team. According to the 2011 Irish census, Ireland had 1,984 Jews by religion in 2011, of whom 1,298 (65%) lived in its capital, Dublin. Leonard Abrahamson (1896-1961), Gaelic scholar, who switched to medicine and became a professor, was born in Russia, grew up in Newry where he attended the local Christian Brothers school and lodged with the Nurock family in Dublin while studying at Trinity College, Dublin. William Annyas (Ãnes), Mayor of Youghal (1555) a Marrano merchant. Francis Annyas (Ãnes), Mayor of Youghal in 1569, 1576 and 1581, Youghal garrison commander and a spy for Francis Drake. Philip Baker(1880-1932) was Irish Chess Champion in 1924, 1927, 1928, and 1929. Leopold Bloom, fictional protagonist of Ulysses. Michael Noyk Irish Republican and solicitor during the Irish War of Independence. Robert Briscoe, member of the Irish Republican Army during the Anglo-Irish War and twice Lord Mayor of Dublin (1956 and 1961). Max Eager (son of George Eager), first Chief Rabbi of Ireland. Maurice Freeman (1875–1951), Mayor of Johannesburg 1934/35. Gerald Goldberg, Lord Mayor of Cork in 1977. Rabbi Yitzhak HaLevi Herzog, Chief Rabbi of Ireland from 1919 to 1937, later of Palestine and Israel. Sir Otto Jaffe, Lord Mayor of Belfast (1899 and 1904). Immanuel Jakobovits, Chief Rabbi of Ireland between 1949 and 1958, later British Chief Rabbi. Louis Lentin, director (documentary films, television, theatre). Ronit Lentin Head of Sociology, the director of the MPhil in Race, Ethnicity, Conflict, Department of Sociology and founder member of the Trinity Immigration Initiative, Trinity College, Dublin. June Levine, feminist, journalist and writer. Maurice Levitas (1917–2001) (born Dublin) was an anti-fascist who took part in the Battle of Cable Street and fought in the International Brigades during the Spanish Civil War. He is the father of Ruth Levitas. David Marcus (1924–2009), author, editor, broadcaster and lifelong supporter of Irish-language fiction. David Marcus, author and professor of Bible and ancient languages at The Jewish Theological Seminary. Yaakov Pearlman, Ireland's Chief Rabbi. David Ricardo, represented Portarlington (UK Parliament constituency) 1819 - 1823. Alan Shatter, former Fine Gael TD for Dublin South and formerly Minister for Justice and Equality and Minister for Defence. Bethal Solomons (1885–1965), medical Doctor, Master of the Rotunda, Irish Rugby International. Estella Solomons (1882–1968), landscape and portrait artist and member of Cumann na mBan. Stella Steyn (1907–1987), Dublin-born artist. Abraham Weeks (or Abraham Wix) was the first person killed during 1916 Easter Rising (A Jewish comrade who joined on Easter Monday and died in action). He joined the Irish Citizen Army and was assigned to the GPO. Little Jerusalem, Portobello for an account of Little Jerusalem. Benson, Asher (2007). Jewish Dublin. Portraits of Life by the Liffey. Dublin: A&A Farnar. ISBN 978-1906353001. ↑ Frassetto, Michael (2006). Christian attitudes toward the Jews in the Middle Ages. CRC Press,. p. 178. ISBN 978-0-415-97827-9. ↑ Gifford,, Don; Robert J. Seidman (1989). Ulysses annotated: notes for James Joyce's Ulysses (2nd ed.). University of California Press. p. 40. ISBN 978-0-520-06745-5. ↑ Duffy,, Seán; Ailbhe MacShamhráin; James Moynes (2005). Medieval Ireland: an encyclopedia. CRC Press. p. 546. ISBN 978-0-415-94052-8. ↑ Lurbe, Pierre (1999). "John Toland and the Naturalization of the Jews". Eighteenth-Century Ireland / Iris an dá chultúr. Eighteenth-Century Ireland Society. 14: 37–48. JSTOR 30071409. ↑ Toland, John (1714). Reasons for naturalizing the Jews in Great Britain and Ireland. Printed for J Roberts, London. p. 77. ↑ Retrieved 5 December 2006. ↑ Lewis Wormser Harris 1998. Retrieved 5 September 2006. ↑ Keogh (2005), pp. xv-xvi. ↑ Lynagh, Catherine (25 November 2005). "Kindertransport to Millisle". Culture Northern Ireland. Retrieved 5 October 2007. ↑ Nolan, Aengus (2008). Joseph Walshe: Irish foreign policy, 1922–1946. Mercier Press. p. 79. ISBN 978-1-85635-580-3. ↑ Leeson, David (2002). "Irish Volunteers in the Second World War". Four Courts Press. ISBN 1-85182-523-1. ↑ O'Halpin, Eunan (2008). Spying on Ireland. Oxford University Press. p. 32. ISBN 978-0-19-925329-6. ↑ Keogh, Dermot, "Jews in Twentieth-Century Ireland: Refugees, Anti-Semitism and the Holocaust" pp. 209–210. The plan to bring over Catholic German children was known as Operation Shamrock. ↑ Department of Justice Memorandum 'Admission of One Hundred Jewish children' 28 April 1948. ↑ "Lenny Abrahamson". Who's who. Irish Film and Television Network. ↑ Keogh, Dermot (1998). Jews in Twentieth-century Ireland. Cork: Cork University Press. p. 68. ISBN 978-1-85918-150-8. ↑ Citron, Michelle. "Rockefeller Foundation New Media Fellowships 2003 Project Cover Form NAME: Michelle CITRON" (PDF). eCommons@Cornell. Retrieved 9 March 2010. ↑ "1. Home 2. News 3. UK News Daniel Day-Lewis aims for perfection". Telegraph.co.uk. 22 February 2008. Retrieved 9 March 2010. ↑ "Faculty Bio: David Marcus". The Jewish Theological Seminary. The Jewish Theological Seminary. Retrieved 26 May 2011.